Claude Turmes, a leading Member of the European Parliament for the Greens party, dropped a bombshell at a Brussels event yesterday (24 February) when he made allegations about Gazprom’s tactics to push the Nord Stream 2 gas pipeline project. The five Western companies co-investing in Nord Stream 2 were told by Gazprom to stop sending gas through Ukraine entirely as a condition for winning the project, Turmes said. “Shell, Wingas [a Gazprom-owned subsidiary of Wintershall] and Engie, are pressured by Gazprom not to be allowed to channel gas via Ukraine,” said the outspoken Green MEP from Luxembourg. “And then the Commission says to me it’s a commercial project. It is lobby-efficient Russian Machiavellianism. This is a political project to divide Europe”. Nord Stream is a Baltic Sea gas pipeline linking Russia directly to Germany, bypassing Ukraine. The project was criticised by the European Commission for running against the EU’s Energy Union goals. The European Commission so far is only aware of general information about the project, and is therefore unable to make conclusive decisions, Commission Vice-President Maroš Šef?ovi? told EURACTIV in an exclusive interview. 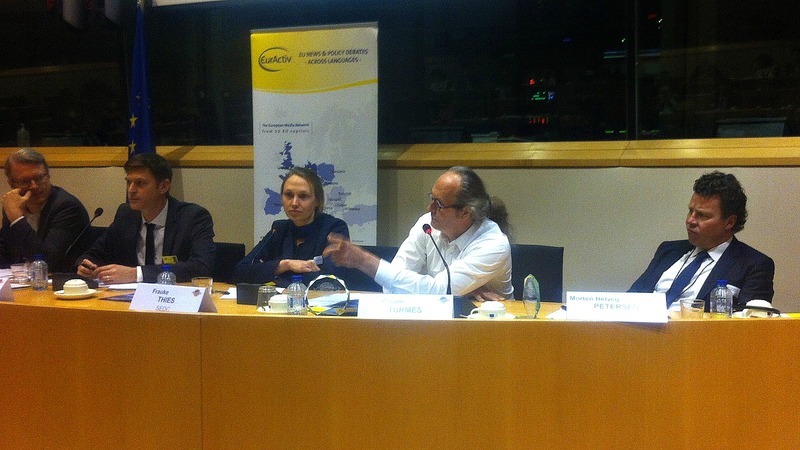 Turmes was speaking at a conference organised by EURACTIV in the European Parliament to mark the launch of the “EurActory40”, a ranking of the 40 leading experts in Energy Union policy. The event was attended by Commission Vice President Maroš Šefčovič responsible for the Energy Union, and former European Parliament President Jerzy Buzek, who were ranked No.1 and No.3 on the EurActory, respectively. No.2 is the German Chancellor, Angela Merkel. 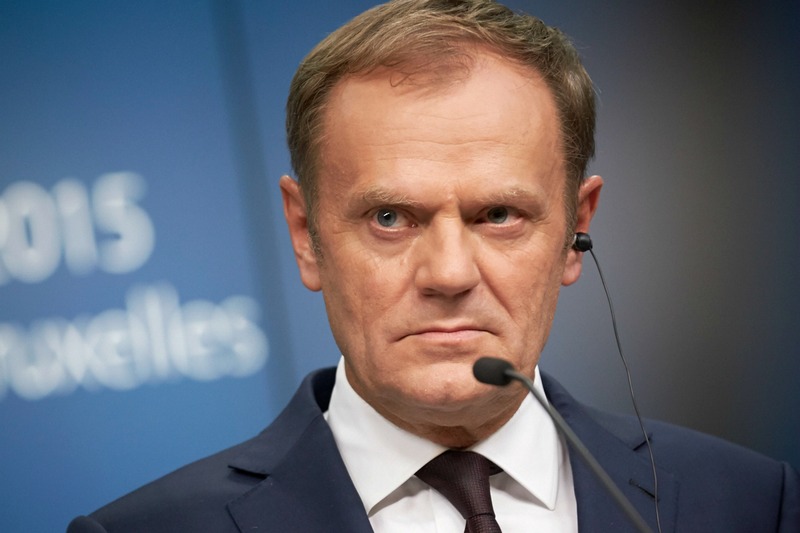 The ‘Visegrad Four’ countries (Poland, Czech Republic, Slovakia and Hungary) found a powerful ally at the EU summit which ended today (18 December) in the person of Council President Donald Tusk, who repeated most of their arguments against the Germany-favoured project. Nord Stream 2 aims at transporting an additional 55 billion cubic metres of gas per year (bcm/y) from Russia to Germany under the Baltic Sea. The project is 50% owned by Russia’s gas export monopoly Gazprom, and by BASF, E.On, Engie, OMV and Shell in portions of 10%. Central European Countries are worried that Nord Stream will allow Russia to scrap its biggest gas route via Ukraine, called the Ukrainian corridor, which carries roughly 140 billion of cubic metres of gas per year (bcm/y). This could deplete Ukraine from gas transit fees, to the tune of €2 billion per year. According to Turmes, Nord Stream 2 is the EU’s “biggest failure” on energy policy. Referring to the EurActory40 ranking, the flamboyant Green MEP said all it took for Nord Stream 2 to win approval from the Commission was “one phone call of No.2 in your list [Ms Merkel] to No.1 in the European Commission ― not Mr. Juncker but Mr. Selmayr.” Martin Selmayr, a German national, is the chief of cabinet of Commission President Jean-Claude Juncker. 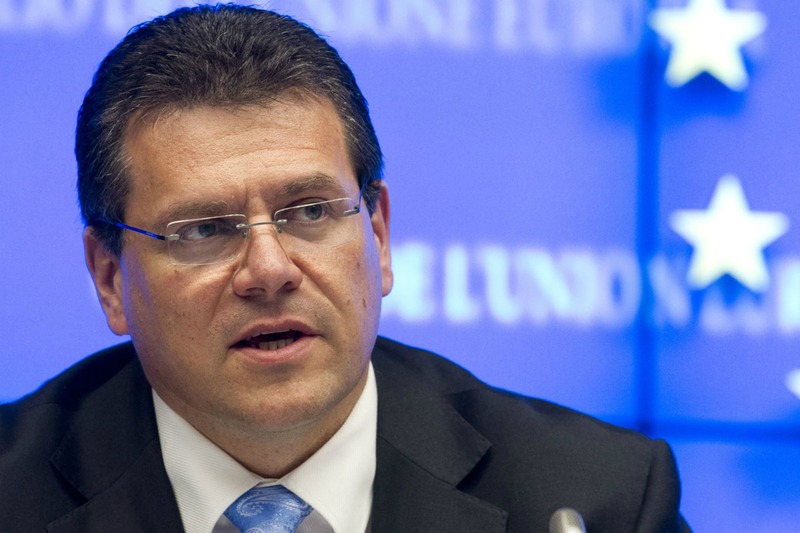 This one phone call “was sufficient to completely change the attitude of Mr. Šefčovič” towards Nord Stream, Turmes said, referring to the Commission’s initial reluctance over Nord Stream. Turmes said that following the phone call, Miguel Arias Cañete, the energy Commissioner, backed down too and the Commission’s legal services “produced a document saying Germany can do Nord Stream and we will not care”. “This is a complete blow to the Energy Union,” the Green MEP repeated. “If the Commission is not strong enough to go against the narrow German interest, I’m afraid this will cause a lot of damage”, Turmes added. “What is the consistency between putting billions into Ukraine, and allowing Russia via Nord Stream to kill Ukraine? I see no consistency in the Commission’s position,” Turmes continued, warning that Parliament would not hesitate to sanction the Commission over the matter. Šefčovič had left the Parliament event by the time Turmes made his comments. He was therefore unable to respond to the MEP’s allegations. But Viacheslav Kniazhnytski, Director of Ukraine’s Naftogaz office in Brussels, warned that the Russian gas transited via Nord Stream 2 to EU customers could turn out to be much more expensive that the gas transited trough Ukraine. The gas arriving in the EU at Uzhgorod, the Ukrainian city at the border with Slovakia, has a fixed price, Kniazhnytski said. But if the gas starts arriving in Germany instead, who will pay for the transportation fee to Germany, and then through the Czech Republic to the Baumgarten gas hub near Vienna, he questioned. Kniazhnytski said Russia claims it can supply gas to Europe at a lower price than LNG coming from the USA, but doesn’t mention a word about the transportation cost. In this context, he argued that the benefits of the Ukrainian system were “outstanding”. Brian Ricketts from the coal lobby association Euracoal urged Turmes to produce evidence of his allegations, saying they were “quite incendiary” and needed to be backed by facts. But Turmes refused to disclose his sources. “You know that normally I’m a well-informed guy,” he said. Jerzy Buzek, who is considered together with Jacques Delors as one of the fathers of the Energy Union, also criticised Germany for the Nord Stream 2 project, although he didn’t expressly name the country. “One country from inside or outside the EU can cause trouble. […] The extension of Nord Stream will mean we will fail to achieve a key goal of the Energy Union – diversification”, Buzek told the Parliament event. The veteran Polish politician who was Prime Minister of his country from 1997 to 2001 regretted that one of the goals of his blueprint for the Energy Union – joint gas purchases – was not taken on board by the Commission draft legislation for the Energy Union. Nord Stream was inaugurated on 8 November 2011, in the presence of then-President Dimitry Medvedev, and Chancellor Angela Merkel. Led by Gazprom, which has put the cost of the plan at up to €9.9 billion and maybe less due to savings, the group is to build a third and fourth pipeline to transport up to 55 billion additional cubic meters of gas a year (bcm/y). It would double the capacity of lines 1 and 2, which take the same route. The new pipelines are due to start transporting gas by the end of 2019. Gazprom, E.ON, BASF/Wintershall, OMV, ENGIE and Royal Dutch Shell formed the consortium for the Nord Stream-2 project. Please cut the jounrnalistic annotations – they do not contribute to the article, e.g. : “outspoken Green MEP” or “the flamboyant Green MEP” – Turmes made some hard hitting points – & if the points he makes are correct – (merkel phone call etc) then it is more fuel on the Brexit flames – oh look Germans say one thing & do another – style of.